Welcome to Defaqto 5 Star rated investing! We’re extremely pleased and proud to announce that our Original and Ethical Plans have been given a 5 Star rating from Defaqto. 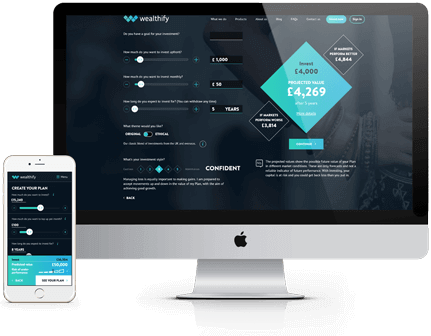 Wealthify Investment Plans are available as a Stocks & Shares ISA, Junior Stocks & Shares ISA and General Investment Account. Customers can choose from five investment styles to suit their attitude to risk: cautious, tentative, confident, ambitious or adventurous. Defaqto is an independent financial information business, helping financial institutions, financial advisers and consumers make better informed decisions. The Star Rating measures important features about our offering, such as the investment performance of our five Plan types (Cautious to Adventurous) and the ability for customers to choose a general investment or ISA account. It also evaluates the tools we’ve created to help customers make their investment decisions, such as the ‘projected value’ diamond, and assesses how fair and transparent we are with customers about issues like risk and the cost of investing. Wealthify’s CIO and co-founder, Michelle Pearce-Burke commented, “getting the coveted 5 Star Rating for both our Original and Ethical Plans from Defaqto is an enormous achievement, given the thoroughness of Defaqto’s assessment processes and the extremely high standards they demand for their highest rating. This is something we are extremely proud of and, along with the awards we’ve received this year, validates all of the work we do to create a genuinely smart and enjoyable investing experience for customers." A Defaqto spokesperson commented, "The Defaqto Digital Wealth Management Star Rating helps consumers to be better informed when selecting a Digital Wealth Management plan. The ratings measure features and are completely comprehensive. They take into consideration not only the customer experience but also the range of investments.